Archaeologists find Jewish gravestones used to build Lithuanian power station. Archaeologists have confirmed that a Lithuanian power station was built using stolen Jewish tombstones. Earlier this month Gledrius Sakalauskas, a local resident, noticed that many of the stones used to build the station contained Hebrew or Yiddish writing. "I touched the stones and I realized that they're really gravestones," he told AP. Sakalauskas says that he is very saddened, but not surprised. There used to be a Jewish cemetery across the street from where the station now stands. The communist government that replaced the Nazis as occupiers of Lithuania also did not look kindly on Jews, and the cemetery was destroyed during the 1960s. Jurgita Verbickiene, a historian with Vilnius University, explains that people saw Jewish cemeteries as "easily accessible and free building material" during the communist period. 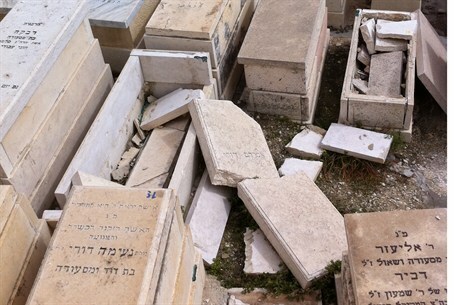 Several other structures, including parts of a church, are being investigated for possibly also using Jewish gravestones for building materials.